The gruff and surly Mr Thomas Oakley is less than pleased when he is landed with a scrawny little city boy as a guest, but because it is compulsory that each villager takes in an evacuee he reluctantly agrees. It soon becomes obvious to Mister Tom that young Willie Beech is hiding something, and as the pair begin to form an unlikely bond and Willie grows in stature and in confidence he begins to forget the past. But when he has to return to war-torn London to face his mother again he retreats into his shy and awkward ways once more. So I have this theory that whenever I read a book where there is a gruff old man who is prickly on the outside but a big softie in the middle, I will love it. This book is one of my all-time favourites and I know I say that about every book, but I definitely mean it this time. 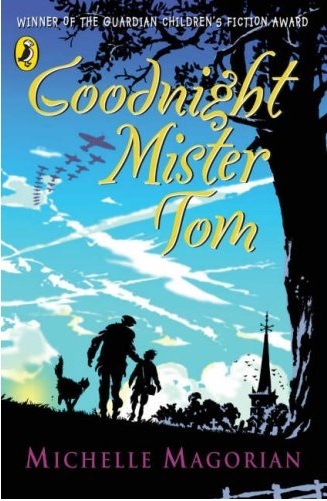 I first read it when I was about ten and I was in Year 5, learning about WW2 and the Blitz and evacuees. Seeing as I had read all the books we had to read and I was allowed to go into the library and choose my own book. And this one was the first book I chose. Ms Magorian’s writing feels so comfortable to me; it’s simple and gentle but never ventures into twee-ness (twee-dom? )… fine, it never becomes twee. The setting is perfectly constructed, the friendships that are developed are honest and true and there is always this rich sense of innocent fun running through the story, which is perfectly balanced with the more harrowing points of the tale. But I’m not talking about them because it just makes me too sad. And let’s not forget Sam who is the most endearing fictional dog since Manchee. As I mentioned, I read this book when I was ten and now twelve years later this book was still beautiful. It has aged extremely well. I still laughed (seriously, Zach and I need to be best friends) and I still got teary at certain parts and I still got a warm feeling in my tummy at that epilogue. An epilogue that made me feel warm and fuzzy. This is book is truly special to me. Also, I just want to say something about the film adaptation. This is a book site! Only heathens talk about film on this site. But whatever, I don’t care. Normally I hate watching adaptations of my favourite books because they never ever EVER measure up. And I think this is the only exception. I think I’ve seen this film at least ten times (five of those viewings were on successive video days on the afternoon of every end of term, The Railway Children in the morning, of course.). 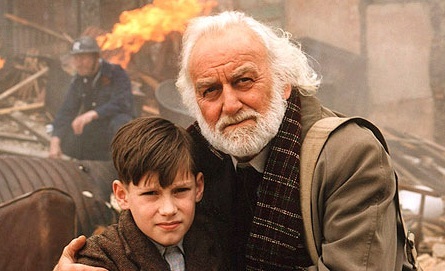 Oh and whoever cast John Thaw as Mr Tom is a champion. And ALSO, why haven’t I gone and seen this play yet?! I know exactly which bit you mean (and yes, I get extremely teary eyed too).